Providing you the best range of digital automatic sequence timer demonstration unit, d.c. position servo system demonstration unit, a.c. position servo demonstration unit, a.c. servo motor demonstration unit, ac synchro transmitter & receiver demonstration unit and ac synchro control transformer demonstration unit with effective & timely delivery. Valued as a reliable manufacturer and supplier, we offer the finest quality of Digital Automatic Sequence Timer Demonstration Unit. 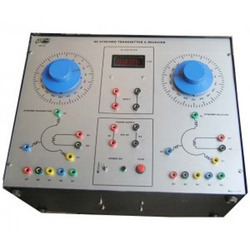 Due to its automatic operation and high performance, the offered digital automatic sequence timer demonstration unit is highly demanded in colleges. 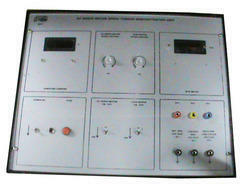 Our patrons can avail the offered digital automatic sequence timer demonstration unit in various specifications. The trainer is enclosed in a specially designed laser’s friendly elegant powder coated metal cabinet with intelligently designed layout on imported acrylic sheet. Instrumentation : Solid State Digital IC based time delay circuit with crystal controlled clock & divider. Timers : Four Independent 2 digit digital timers. Time Duration : 99 seconds / 99 minutes (selectable) for each timer. Readout : 2 digit digital 0.5 inch Red for each timer. Time Setting : Two ten position coded push button switches for exact time delay adjustment in 99 distinct steps for each timer. Relay Contact : 1. C.O 230V, 5A contact for external load for each timer. Auxillary Relay : For recycling operation. Operation : Timer in any sequence with independent timings. Dc Source : 5V DC Regulated 12V DC regulated. Controls : 1. Time setting control (4 set). Indicators : 1. Relay ON indicator (4). Test Points : Provided at inputs and outputs of each timer circuit to observe waveforms and voltages. Power Requirements : 230V, 10% AC, 50Hz, 1 phase. Panel Size : 410mm × 320mm. Standard Accessories : 1. Set of required patch cords. ADTRON’S DC position Servo System Demonstration Unit is a versatile self – contained stand – alone demonstrator, useful in the study and demonstration of the principle and working of a DC position Servo System. 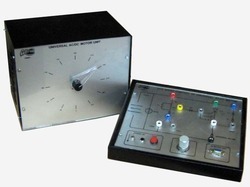 It consists of a common potentiometer with calibrated dial as master or input transducer and a rebalance potentiometer to convert output position into a voltage signal along with specially designed DC motor with suitable coupling, feedback patch, summing amplifier, preamplifier and power amplifier. 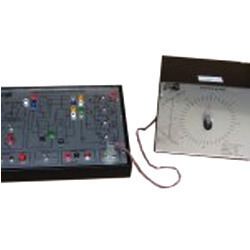 Various controls for different parameters are provided It is a highly accurate, highly sensitive demonstrator with good repeatability, linearity and fast response. 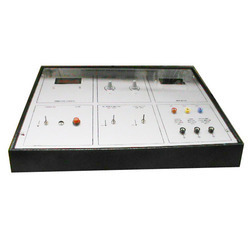 The unit is housed in an elegant cabinet with a well spread intelligently designed circuit layout on the front panel. Multi – coloured test points are provided at various stages in the circuit to observe waveforms and voltages. It is strongly supported by a comprehensive instruction manual complete with theory & operating details. Motor : Specially designed bi – directional, geared, permanent magnet armature controlled DC motor. Coupling : Suitable coupling of motor to output re – balance potentiometer. 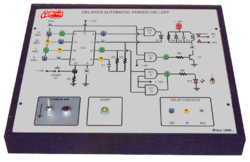 Amplifiers : Summing amplifier of adjustable gain pre – amplifier and power amplifier for driving DC on basis of error signal. Amplifier Gain : Controlled by the Voltage signal derived by the conversion of the output position of rebalance potentiometer into voltage signal. Output : Slave dial coupled to the servo mechanism and mounted with calibrated dial (0 deg to 270 deg ). Controls : 1. Master or command potentiometer. 2. Potentiometric for zero adjustment. 3. Potentiometric for span adjustment to adjust the minimum ( lower limit ) & maximum ( upper limit ) of angular displacement. 4. Potentiometric for gain adjustment. 5. Servo Motor ON / OFF control. 6. Mains ON / OFF. 2. Servo Motor ON / OFF. 3. Mains ON / OFF. Test Points : Provided at various stages in the circuit to observe waveforms and voltages. Power Requirements : 230V, ± 10% AC, 50Hz, 1f. Standard Accessories : Detailed Instruction Manual. instruction manual complete with theory and operating details. Input Voltage Range : 170V to 270V AC. Output Voltage : 230V (Can be preset from 220V to 240V). Current Capacity : Max. 4A. Frequency Range : 45Hz to 65Hz. Motor : AC Servo motor coupled to the variac. Speed Of Correction : Better than 35V / sec. Protection : 1. Under / Over voltage Tripping. * Demonstrates the speed torque characteristics of AC servomotor. * Specially designed AC servo – motor with required power supplies. * Speed control of AC servo – motor by changing the control winding voltage. * Reference winding voltage 230 V and control winding is applied variable 230V. * a coupled DC motor with variable speed control. (Variable load). * Non – contact type tachometer for measuring the speed of the AC servo – motor and is indicated by an analog RPM meter. * Current meter to indicate the armature current of the AC servo – motor. * Plotting the characteristics of Speed v/s Torque. * Multi – coloured test points are provided at various stages in the circuit to observe the voltages and waveforms. ADTRON’S Synchro Transmitter and Recevier Demonstrator is versatile self contained stand – alone demonstrating system useful in the study and demonstrations of the principle and working of an AC Synchro Transmitter and Receiver. 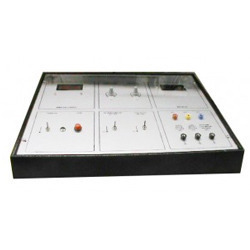 It consists of a synchro transmitter and synchro receivers, which are specially, designed induction type low friction component consisting of a wound rotor and wound stator. These are mounted with calibrated dials. 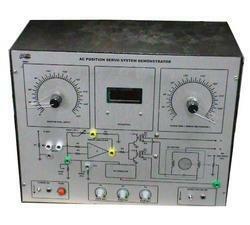 A step down isolation transformer and a voltmeter are also incorporated. The demonstrator is housed in a specially designed user’s friendly elegant cabinet with intelligently designed layout on front panel. It is strongly supported by a comprehensive instruction manual complete with theory and operating details. 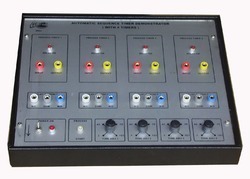 Principle : AC Position control system. AC Synchro Transmitter & Receiver. Adtron’s AC Synchro Control Transformer is an important member of the synchro family. 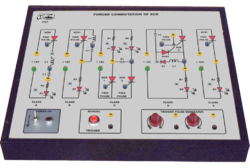 It is a versatile demonstration unit useful in the study and demonstration of the principle and working of an AC Synchro Control Transformer, in conjunction with AC Synchro Transmitter & Receiver. It is a specialised five terminal, induction type low friction component consisting of a high impedance wound stator. It is mounted with a calibrated dial with two rotor and three stator windings brought out on front panel. The demonstrator is housed in a specially designed user’s friendly elegant cabinet with intelligently designed layout on front panel. It is strongly supported by a comprehensive Instruction Manual complete with theory and operating details. Principle : AC Position control system. 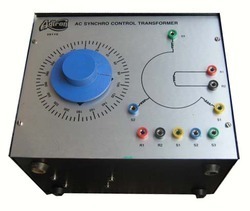 AC Synchro Differential Generator. Displacement : Angular displacement ; Clockwise & Anti – clockwise. Control Transformer : Specially designed reversible five terminal component with high impedance stator winding. Mounting : It is mounted with calibrated dial on front panel. Controls : Control Transformer knob mounted on its shaft. Test Points : Multi – coloured test points are provided at various stages in the circuit to observe waveforms and voltages. Power Requirements : It will derive its required power from AC Synchro Transmitter & Receiver. Standard Accessories : 1. Set of required number of patch cords. 2. Detailed Instruction Manual. The AC Synchro Control Transformer requires Adtron’s AC Synchro Transmitter & Receiver demonstrator for performing the experiment. Magnetic Amplifier : High gain, vacuum impregnated with twin storable reactors. Reactor : Storable, made of torroidal core. Core : Torroidal, cold rolled grain oriental core with low loss & high permeability. Windings : 1. Load (gate) windings wound dividually on each saturable eactors. 4. Feedback winding, control bias and feedback windings are wound on the two saturable reactors combined together. Rectifier : Set of diodes. Load Capacity : 100W ( max ) facility for connecting external load. Adtron’s DC Motor Control Using SCR, Model – 2031 is a versatile self contained stand alone unit useful in the study and demonstrates the principle and working of a DC Motor control using SCR. 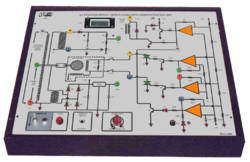 Full wave AC phase control circuit using UJT and SCR for motor speed control and a PMMC DC motor with pointer are provided. The trainer is housed in a specially designed user’s friendly elegant powder coated metal cabinet with intelligently designed layout on imported acrylic front panel. 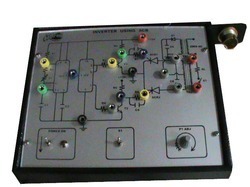 Multicoloured test points are provided at various stages in the circuit to observe the waveforms and voltages. It is strongly supported by a comprehensive instruction manual complete with and operating details. Motor : PMMC 12V DC. Type Of Control l : Firing angle of SCR. 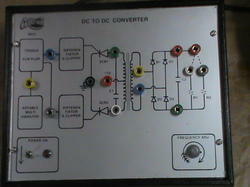 Controlled Output : DC voltage, using full wave AC phase control by UJT & SCR. Mounting : Motor mounted in a separate metal cabinet with front panel and pointer. Controls : 1. Potentiometer for varying firing angle (speed variation). 2. Mains ON / OFF. Indicator : Mains ON / OFF. Size : 8 inch ´ 10 inch Main unit. Adtron’s DC to DC Converter using SCR trainer is a self contained stand alone unit useful in the study and demonstration of the principle and working of a DC to DC converter. Here low voltage DC is converted to high voltage DC. It consists of DC source digital trigger circuit of variable trigger frequency along with complementary voltage type commutation and rectifier. The unit is housed in an elegant metal cabinet with a well spread intelligently designed circuit layout on the front panel. Multicoloured test points are provided at various stages in the circuit to observe waveforms and voltages. It is strongly supported by a comprehensive instruction manual complete with theory and operating details. Principle : Conversion of low voltage DC to high voltage DC. DC Source : 12V DC (unregulated). Type of Inverter : Parallel Inverter. Trigger Circuit : Digital trigger circuit with variable control. Trigger Frequency : 25Hz to 170Hz (variable). Commutation : Complementary voltage type. 2. Potentiometric for variable trigger frequency. Indicators : Mains ON / OFF. Power Requirements : 230V, 10% AC, 50Hz, 1f. Panel Size : 8” ´ 10”. * Demonstrates the principle of DV/DT limitation of SCR. * Calculation of Dv / Dt using formula. * Observation of the pulse on the CRO. * Built – in IC based DC regulated supply with LED indication for supply ON. * Multi – coloured test points are provided at various stages in the circuit to observe the waveforms and voltages. * Set of required number of patch cords. 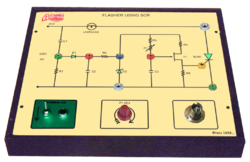 * Demonstrates the principle and working of a Flasher using SCR. * Built – in IC based DC regulated power supply with short circuit protection. * UJT as oscillator with variable triggering pulses. * Lamp load provided on panel. 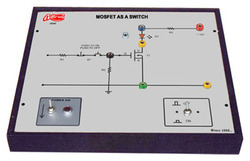 * Test points provided on panel at various stages in the circuit to observe the waveforms and voltages. * Demonstrates the principle and various methods of Forced Commutation of SCR. 1. Self Commutation by resonating load ( Class “A” Method ). 2. Self Commutation by an L C Circuit ( Class “B” Method ). 3. Complimentary Commutation ( Class “C” Method ). 4. Auxiliary Commutation ( Class “D” Method ). 5. External Pulse Commutation ( Class “E” Method ). * Built-in IC based DC Regulated Supply and LED indication for supply “ON”. * Built-in load facility in the form of LED’s. * Connecting each circuit separately and verifying its principle. * Multicoloured test points are provided to observe the waveform and voltages. 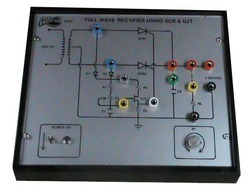 * Demonstrates the principle & working of a full wave rectifier using SCR & UJT. * Built – in power supply. 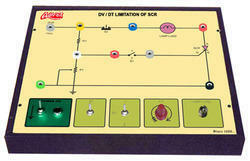 * Operation of UJT as relaxation oscillator & its use as SCR trigger circuit. * Control for UJT trigger pulses. * Full wave rectification by SCR’s. * Observation of output voltage variation with variation in trigger pulses. 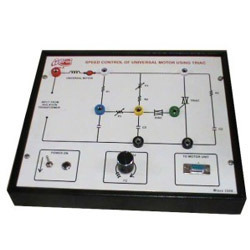 * Test points provided at various stages in the circuit to observe the voltage and waveforms. Adtron’s Inverter using SCR Trainer, Model – 2032 is a self – contained stand – alone unit useful in the study and demonstration of the principle and working of an Inverter using SCR. It consists of a DC source with UJT triggering circuit of variable frequency along with complementary voltage commutation and AC output. A 15W bulb is given as load. The unit is housed in an elegant metal cabinet with a well spread intelligently designed circuit layout on the front panel. Multicoloured test points are provided at various stages in the circuit to observe the waveforms and voltages. It is strongly supported by a comprehensive instruction manual complete with theory and operating details. Principle : Conversion of DC to AC using SCR’s. Trigger Circuit : UJT trigger circuit with variable trigger frequency. Trigger Frequency : 25Hz to 1750Hz (Variable). Output : AC 10 to 20 Watts (approx.). 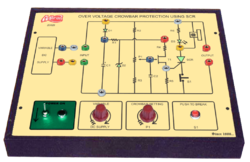 * Demonstrates the principle and working of Over Voltage Crowbar protection using SCR. * Built – in unregulated variable DC power supply. * Over voltage protection using crowbar technique. * LED and Buzzer for over voltage indication. * Variable Crowbar setting or panel. * Push to break switch to reset the protection circuit. 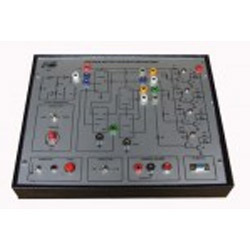 * The circuit consists of zener, UJT, SCR & other associated components. 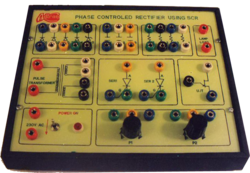 * Demonstrates the principle and working of phase controlled rectifier using SCR by various methods. * Resistance trigger, RC, trigger, UJT trigger – resistance controlled ramp. 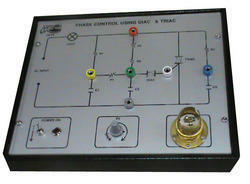 * Limited range / full range half wave phase control. * Limited range / full range full wave phase control. * SCR’s in inverse parallel configuration. * Lamp as load is provided on the panel. * Effect of phase control can be observed on load. 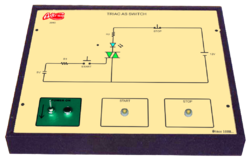 * Demonstrates the principle and working of phase control using Diac & Triac. * Intensity Adjustment potentiometer on panel. * Lamp as load on panel. * Diac used as pulse generator for gate trigger of Triac. * Test points provided at various stages in the circuit to observe voltages and waveforms. 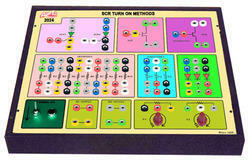 * Demonstrates the principle and different methods of SCR Turn On. * Built – in IC based DC Regulated Supply and LED indication for supply “ON”. * Built – in Resistive load. Completely self – contained stand – alone unit. 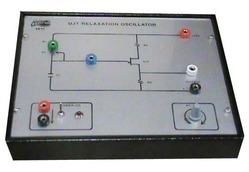 Demonstrates the principle and working of UJT Relaxation Oscillator. Built – in IC based DC regulated power supply with short-circuit protection and LED indication for supply “ON”. Operation of UJT as relaxation oscillator and observation of the sawtooth and pulses waveform. Control for UJT trigger pulses by varying the charging time of emitter capacitance of the UJT. (Frequency 20Hz to 1KHz ). Test points provided at various stages in the circuit to observe the waveforms and voltages. Housed in an elegant cabinet with a well spread intelligently designed circuit layout engraved on the front panel. 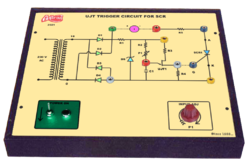 Demonstrates The Principle And Working Of Ujt Trigger Circuit For Scr. Built – In Unregulated Power Supply. Ujt Trigger Circuit With Unregulated Dc Supply. Trigger Angle Can Be Varied From About 30o To 150 O. Trigger Output Can Be Applied To The Gate Of Scr And Turn On Of Scr Can Be Observed On Cro. SALIENT FEATURES : * Completely self – contained stand – alone unit. * Demonstrates the speed torque characteristics of DC servomotor. 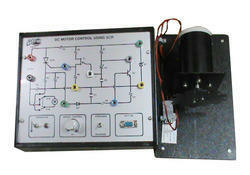 * Specially designed DC servo – motor with required power supplies. * Speed control of DC servo – motor by changing the control voltage. * Measurement of the back EMF of a motor coupled to the servo – motor. * Loading of the DC servo – motor by a coupled DC motor with variable speed control. ( Variable load). * Non contact type tachometer for measuring the speed of the DC servo – motor and is indicated by an analog RPM meter. * Current meter to indicate the armature current of the DC servo – motor. * Calculation of Torque in terms of current (IA) and back EMF (EB) using the torque formula. * Plotting the characteristics of Speed v/s Torque. * Multi – coloured test points are provided at various stages in the circuit to observe the voltages and waveforms. 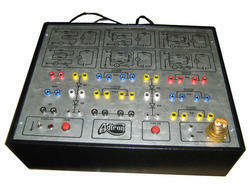 * Housed in an elegant metal cabinet with a well spread intelligently designed circuit layout on the front panel. * Strongly supported by a comprehensive instruction manual complete with theory and operating details. Looking for Industrial Power Electronics ?